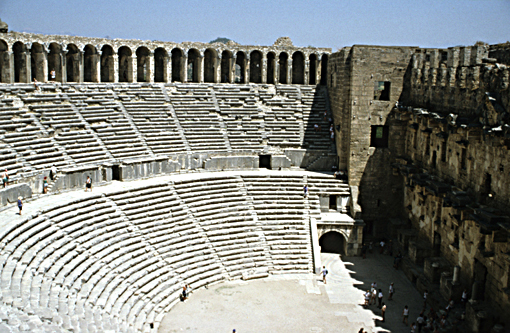 The theatre of Aspendos is one of the best preserved theatres of the Roman world. It is situated in Lycia (Turkey) at about 15 km from the mediterranean coast. The history of the city goes probably back to 1000 BC. Romanisation started in 190 B.C. The theatre was built in the period 161 - 169 A.D. on the south-east slope of the hill on which the ancient city was developed. According to bilingual inscriptions the construction was payed by A. Curtius Crispinus Arruntiatus and A. Curtius Crispinus Auspicatus who executed the will of A. Curtius Crispinus. At the same time another inscription mentions Zeno as the architect. 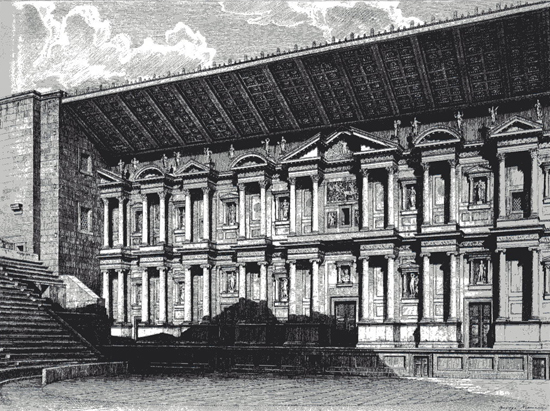 It is one of the few roman buildings of which the name of the architect is known. When we look at the proportions of this theatre it is clear that it was conceived and executed by a skilled architect who knew exactly how to work with general proportions. The overall width of the theatre is 96 metres, the width of the stage is half the width of the building (48 metres) and the diameter of the orchestra is half the width of the stage (24 metres). 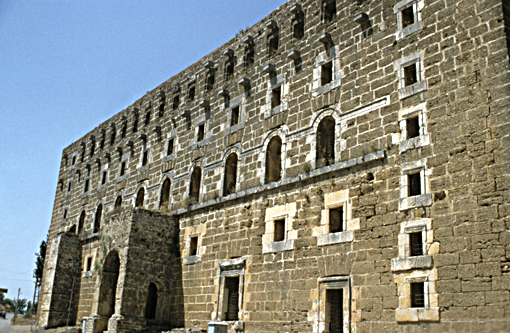 The height of the scaenae frons (including the triangular pediments) is 2/3 of the diameter of the orchestra (16 metres). The scaenae frons is a rectilinear wall with columns on two storeys in a diminishing order. Where there seems to be a proportional system in the general layout of the theatre there seems to be no basic system in the organisation of the scaenae frons. This is in contradiction with the vitruvian prescriptions. As can be seen in the table below Vitruvius propagated a clear system based on fixed proportions that can be reduced to the same denominator. If we use in this case only the two lower storeys of the vitruvian proposals the height of the scaenae frons is 3/4 of the diameter of the orchestra. If we compare this system to the theatre of Aspendos there seems to be no system at all. This is clearly illustrated in the table below. This scaenae frons is one of the few which presents the least controversial roof at the top. Vitruvius doesn't mention it. At the top of the stage wall there are 18 beam slots. The slots would presumably have taken both the upper and lower beam of a cantilevered roof structure. There are 18 corresponding slots near the top of the postscaenium wall on the side facing towards the stage and the roof beams would have run from these slots to the front of the stage, a distance of just over 13 metres, and have been neatly supported by the scaenae frons wall which was almost midway between those two points. 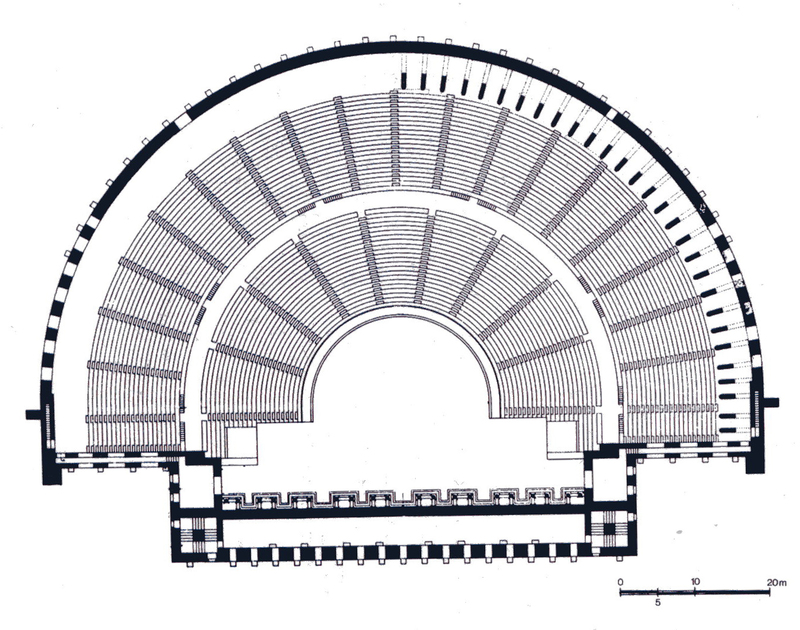 The cavea is formed by two tiers of seats. Each tier has 20 rows. The lower tier (ima cavea) is divided in 11 blocks (cunei) and has a capacity of probably ± 2.600 spectators while the upper tier (summa cavea) is divided in 20 blocks which could give place to ± 4.800 spectators. This division in 11 and 20 cunei contrasts sharply with the vitruvian rule where the position of the stairs between the cunei is fixed by the basic formative triangles of the theatre layout. The top of the cavea is surrounded by a continuous portico. 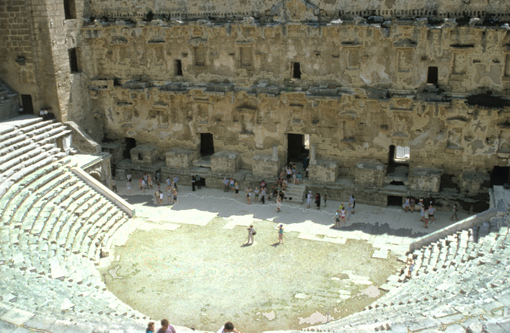 In this the theatre of Aspendos conforms to the vitruvian prescription. The top of this portico is level with the roof over the stage. It is possible that in a later phase there were additional rows of seats installed on the roof of this porticus. In the late 19th century there was still a row of arches at the outside above this porticus. The orchestra is surrounded by a podium wall with a height of 0,59 metre while the rectilinear proscaenium wall has a heigth of 1,39 metre, which again is within the vitruvian rule. Indeed, according to Vitruvius the maximum height of the stage is 5 roman feet or 1,47 metre. At the top of the backside of the postscaenium wall there is a row of 17 rectangular openings with projecting stones below and above. The upper row of stones is perforated. This installation was clearly intended to hold a series of masts. It is possible that these masts supported an awning (vela) but, since the other end of the installation is missing, it is not clear how it could function. Anyway, since the theatre is facing east south east, an awning is not a luxury product. Spectators sitting in the cavea were almost during the whole day exposed to the heath of the sun ad it was only in the evening that a great part of the audience could enjoy shade. A. Boëthius - J.B. Ward-Perkins, Etruscan and Roman architecture, Harmondsworth, Baltimore, Victoria, 1970. P. Gros, L'architecture romaine, I Les monuments publics, Paris, 2002. F. Sear, Roman theatres, an architectural study, Oxford, 2006.